I have an obsession with socks/stockings and have a complete drawer full of everything from cotton, wool to my favorite compression stockings. I mainly wear compression stockings for toning my legs but they are used for many other causes, mainly medical related conditions. I discovered about compression stockings or “Flight Stockings” when I was traveling to Turkey in winters. They soon became my “do not leave home without them” travel item years ago on my first non-stop trip to the USA, where I visited 8 states. 16 hours on a plane? I read all types of articles on deep vein thrombosis (DVT) which sounded really scary and was convinced I needed to be proactive since I was planning lots of long-haul travel in a relatively short period of time – over 100,000 miles to be exact. DVT is when a blood clot forms in one of your deep veins, or your legs when traveling and can cause leg pain, swelling or worse. I discovered in my research that compression stockings or travel stockings, as they are now advertised, were an easy solution. My first pair of travel stockings made their way to the USA and are still in my sock drawer today. So when I got to collaborate with Al Manara Pharmacy, to review some of the products that they retail, I just had to choose Solidea Anti Trombo Compression Stockings. Not only are they helpful in avoiding DVT but they are also very useful in controlling cellulite and managing Varicose Veins. Solidea Anti-thrombus Thigh high compression stockings for prevention of deep vein thrombosis (DVT) and pulmonary embolism (PE). The special three-dimensional knit fabric makes them soft and comfortable. They are made of bacteriostatic yarn that thanks to the presence of silver ions prevents the proliferation of bacteria ensuring the biological balance of the skin. Indicated in case of surgical interventions, in the case of childbirth, long bed rest especially in elderly patients, neurological, multiple trauma. Composition 80% NYLON 20% ELASTANE. Toning from top to toe – If you like wearing leggings or skinny jeans, you’ll love the effect of these anti-cellulite thigh highs. Giving you a slimmer and more toned appearance all the way from ankle to thighs, the unique Silver Ion fabric massages your legs all over to improve your circulation. As well as helping you look great, this graduated compression ensures no more tired, aching or heavy legs – giving you a welcome energy boost all day long. 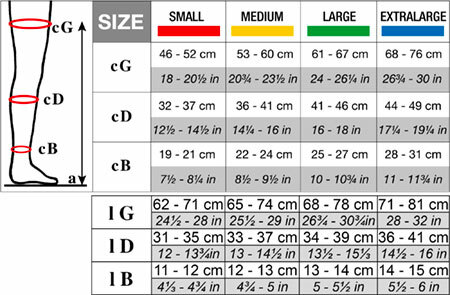 To choose the most appropriate size, you should measure the circumferences at the point “b” and “d” and then refer to the following table. Compression stockings come in a variety of sizes, lengths, and colors. They’re also available with different strengths of compression. Your legs will be measured to see what size stockings you need, and your GP, nurse or pharmacist will check if they fit properly. You may need to wear them on both legs or just on one. You should wear your compression stockings during the day and take them off before going to bed. Put them on again first thing in the morning. Otherwise, if it’s not for any medical condition, then you can wear them during workouts or flights. You should be given at least two stockings, or two pairs if you’re wearing them on both legs. This means you can wear one stocking (or pair) while the other is being washed and dried. Hand-wash your stockings at about 40C/104F (comfortable hand temperature) and dry them away from direct heat. Solidea Anti-thrombus Thigh High compression stockings are available at Al Manara Pharmacy all across UAE. Compression Socks are useful to improve the the blood circulation & helped to prevent a variety of health conditions including varicose veins, spider veins, and chronic venous insufficiency. Thanks!